The education of our young people is a priority for our families and our communities here in the 75th district, and it needs to be a top priority for our state lawmakers, too. Education is quite literally the key to our future. In the last eight years, state funding of our public schools has been decimated. 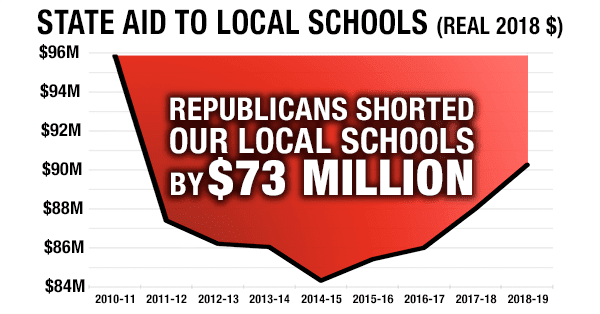 Even with education funding increases in the most recent budget, our public schools are still receiving less money from the state than they did in 2010-2011. My opponent is touting “record” funding for our schools, but his claim ignores inflation. Politicians may be able to pretend inflation doesn’t exist, but our families and schools don’t have that luxury. On top of that, an increasing amount of that precious state funding is being taken out of our public schools through the statewide voucher program and sent to private religious schools. This is unacceptable. We cannot maintain our world class schools by starving them of funding and diverting our tax money away from them. All figures adjusted for inflation to 2018-dollars. Click here to check our math. Amount Short compares actual state aid vs maintaining 2010-11 aid levels. It is time for the State of Wisconsin to live up to its commitment to pay for 2/3 of the costs of educating our kids in public schools. The state currently falls far short of that commitment, paying only around 46% of public school costs. We can and must drastically increase state funding to our schools WHILE reducing property taxes for people in the 75th district. And we need to fix the funding formula that is skewed against smaller, rural districts like so many in our area, so that this state funding is distributed in an equitable way. State Superintendent of Public Instruction Tony Evers has proposed a school finance reform system called Fair Funding for our Future, which fixes some of the biggest problems of the current funding formula. We also need to end the statewide voucher program. Public dollars are for public schools, and by making these crucial investments in our public schools, we will ensure that every student’s needs are met, and that every child has a full range of educational opportunities available to them. It is not only our kids who need the support of our state lawmakers, but our public school teachers as well. It is shameful that here in Wisconsin, we’ve been paying for tax cuts for millionaires by demonizing and punishing the dedicated people who educate our children. I am so proud to work for public school teachers in this area, and I’m inspired by their tireless commitment and professionalism in the face of the attacks against them by our lawmakers. Plus, as the mom of a daughter in 3rd grade at Cumberland Elementary, I see every day just how great of an impact an incredible educator can have. I hear from our rural school districts, who used to get dozens of qualified educators applying for an open teaching position, that they're now receiving only 1 or 2 applications, and often the applicants don't meet the qualifications. In order to reverse this trend and strengthen teacher retention, we must increase teacher compensation.